Preheat oven to 375° F. Heat oil in large ovenproof skillet over medium-low heat. Add onion and bell pepper; cook, stirring frequently, for 10 minutes, or until soft. Add garlic; cook, stirring frequently, for 1 to 2 minutes. Add cumin, paprika, and cayenne pepper; cook, stirring frequently, for 1 minute. Add tomatoes, salt, and pepper; cook, stirring occasionally, for 10 minutes, or until sauce has slightly thickened. Add cheese & mix into sauce. 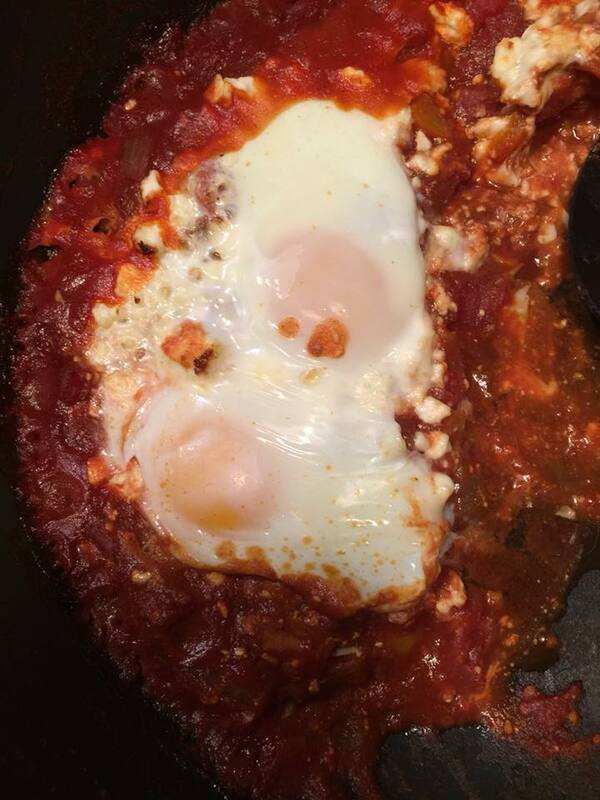 Crack eggs separately into sauce; do not mix. Place skillet in oven. Bake for 10 minutes, or until eggs are cooked to desired doneness. Serve immediately & sprinkle with parsley and pepper sauce (if desired).